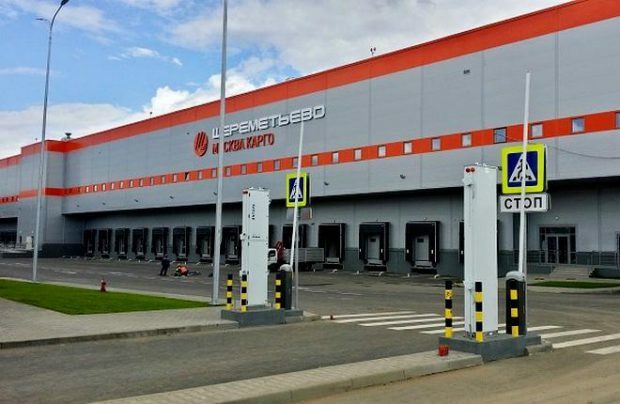 Work to build a new automated cargo terminal, known as Moscow Cargo, has been completed at Moscow’s Sheremetyevo airport. The facility, with a total area of 43,000 square meters and an annual capacity of 380,000 tons, has already been approved by the oversight authorities. The termnal is equipped with an automated seven-tier shelf storage and movement system, which provides storage space for 3,198 pallets. There is also a four-tier container storge area, equipped with a ULD automated processing system with a total capacity of 576 cells, of which number 60 offer temperature control for thermal-sensitive cargo. The facility has 13 conveyor lines with outlets to the airside, and 29 cargo delivery points. The terminal equipment and IT systems are currently being tested, a Sheremetyevo representative told Russian Aviation Insider. The facility is scheduled to become operational in September this year. The cargo terminal project is designed to foster further development of Sheremetyevo into a cargo hub, an initiative the airport is pursuing jointly with Aeroflot and Volga-Dnepr Group (which includes the freight specialist of the same name and sister company AirBridgeCargo). Both Aeroflot and AirBridgeCargo are Russia’s leading airlines by the volumes of cargo and mail carried. Construction of the terminal began in March 2016. The project is part of a larger strategy to upgrade Sheremetyevo for the coming 2018 FIFA World Cup. The facility’s capacity could later be expanded to 1 million tons of cargo per year, depending on market demand. The terminal will be managed by Moscow, the primary freight and mail processing operator at Sheremetyevo. In the first half of this year it processed 90% of all cargo that passed through the airport. The volume of freight carried on international routes grew by 80.5% year-on-year, the company reports, and its share in the total Sheremeyevo freight traffic exceeded 70%. At the same time, domestic freight traffic demonstrated a 5% decline.